Tab, also known as tablature, is an important tool that allows guitar players to easily learn how to play melodies, chords, and songs. Instead of using symbols like it is in standard musical notation, it uses ordinary numbers and characters. Learning how read guitar tabs can be a mystery for some newer guitar players. Here is a step by step guide on how to read guitar tabs. For this one, the top is the bottom. Your thinnest string is pictured on the top, so when you hold your guitar by the guitar neck and place your hand, your fingers will wrap around the guitar neck at the first string. By doing this, your fingers will be right in place to follow along with the tab. Repeat signs are there to enable you to know that you are supposed to repeat that section of notes. The number of times you repeat depends on the song. Hammer on is done by picking up a note and then hammering is done with the fretting hand on the second note (see video here). Actually, the second note is not picked but kind of echo the first one. Hammer-ons are one of the standards in guitar techniques. If done the right way, this sounds really cool. For a slide, begin by plucking the first note then slide on the string up or down to the second. Pull off is the exact opposite of hammer-on. 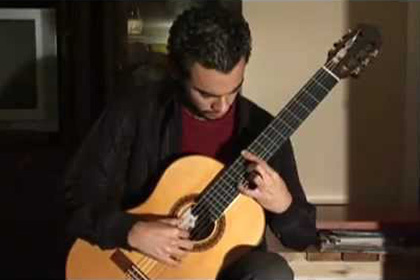 The first note is played then the fretting hand pulls off the finger and lets the one fretted behind it to play. Either picking of the individual chords or notes or up or down strumming. One should put more efforts on being good at playing or picking in both directions to make the music flow. They are a group of notes that are sounded by a single or series of up or down strokes with your strumming. To tab a chord, notes would be positioned vertically upon the horizontal lines ones. This is where the fretting hand bends the string to provide a wobbly effect. Often it is used in blues, rock, country and Christian music. Bends add attitude to the music in a good way. This is another technique for adding amazing sounds to your music. It is just like a constant rhythmic bending off the string. It’s a wiggling of the string up and down to bring a variation on the pitch up and down. Natural harmonics can add up bell-like sounds when you touch a string with your finger over a particular fret bar. The most commonly used notation is the fret that one touches with romb sign before.